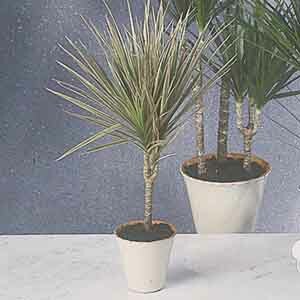 A Dracaena species that does best in bright light, marginata has narrow leaves set off by intense red edges. Eye-catching on its own, this selection also looks great paired with green or silver leaved plant companions. Perfect for all kinds of containers. May be displayed outdoors in warmer weather. Makes a breathtaking potted specimen plant. Water thoroughly but allow soil to dry slightly between waterings. Apply a balanced liquid fertilizer monthly during active growth. Dust or wipe off leaves for best display.